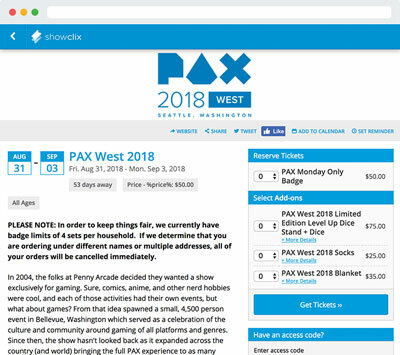 With vibrant event pages and a complete suite of ticketing tools, online ticket sales are just the beginning of what ShowClix can do for event organizers. Your event day will be an easier, more successful experience for you, your staff, and your customers. For everything from table seating and group sales to coupon management and application forms, we provide a complete set of features for any type of event. 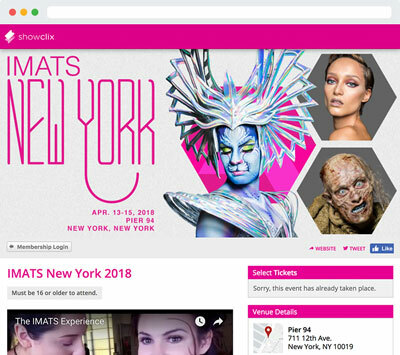 Make ticket purchasing more convenient for customers with mobile ticket delivery and beautiful event pages that work on any device and your own website. Our engineers painstakingly test and prepare our system to make sure customers have a smooth buying experience, even when thousands of transactions are happening at the same time. We charge a small fee per ticket that 90% of our clients pass on to their ticket buyers. Most organizers pay nothing to use our service. 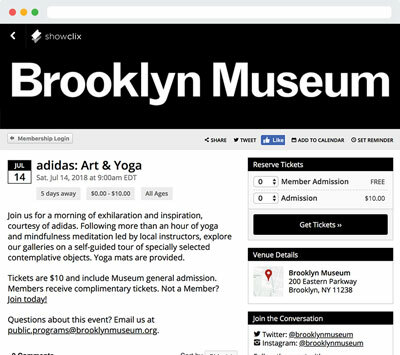 Organizing events and selling tickets is not as simple as adding a button to your website, so our system offers a suite of features and tools that can make your ticketing experience as unique as your event. Setting up timed ticketing or daily admissions? Manage an entire series of recurring events from the top down. Create one event for your tour groups or weekend theater performances and instantly build a schedule to replicate its details across all events in the series. Whether you’re running a long recurring event series or adding the next few months of shows at your venue, customers can browse events and purchase tickets from a complete, easy-to-navigate event calendar. Sell one set of tickets across venues or multiple smaller events. Provide one barcode per ticket to scan, no matter how many events are included. You can even include merchandise with ticket sales to get that extra revenue bump from larger, bundled transactions. Grant access to special members-only events and pricing. Manage coupons for discounts, comps, reserved seats and more. Provide an easy way to include donations during checkout. Let customers determine their own price, based on a minimum per ticket. Implement payment installments for high-price ticket orders. Accept payments over time from multiple customers for group ticket orders. Sign in to our real-time analytics app, Live, for an instant update on your sales, or track your success at a glance by keeping Live on a second monitor. With our companion iOS and Android apps, you can monitor your ticket sales anywhere. Dig deep with our report templates when you need an update on how your event is selling. We’ll even let you connect with third-party metrics like Google Analytics to monitor your marketing success! Focus your business on sales and client relations, and leave the software development to us. Our open API allows your developers to completely integrate with the system. Pull ticket sales and customer data into your organization’s CRM. Automatically post event listings to your website and implement a dedicated event search engine. Keep your business in the spotlight with our completely customizable solution, which will establish you as a modern ticketing provider. 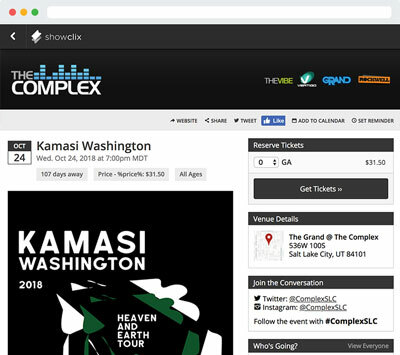 Add your branded look to the system, event pages, tickets and more. Manage your network of clients who are using your ticketing platform. Scale to meet the needs of massive and diverse events, while supporting multiple currencies, payment options and internationalization services. Our powerful analytics tools help you gain new insight into your events and customers. Create successful, data-driven strategies that save your organization time and money. 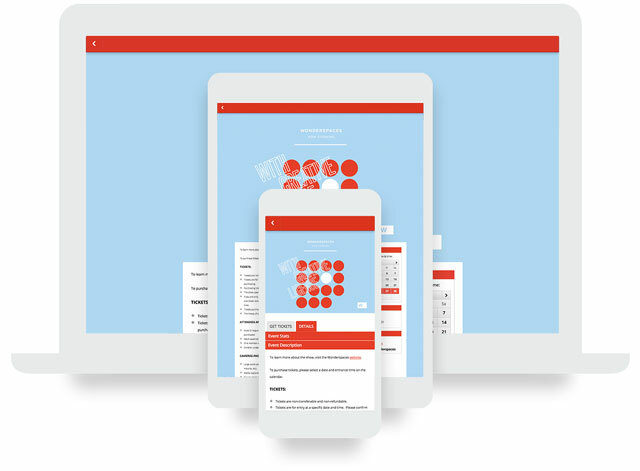 Remove the guesswork from your marketing campaigns, easily define audiences for targeted communication, detect trends in ticket sales and customer behavior, and build custom, flexible reports for all of your events. Our reserved seating venue builder allows you to create a replica of your venue. Purchasing preferred seats and editing inventory, tables, coupons and holds has never been easier. Our event specialists will build an interactive, easy-to-browse version of your seating chart. Whatever your venue’s seating situation, our system can support all types of arrangements. Edit seats, holds, price levels and inventory on the fly. Reduce call volume by making it easier for customers to choose their ideal seats online. First impressions are important. 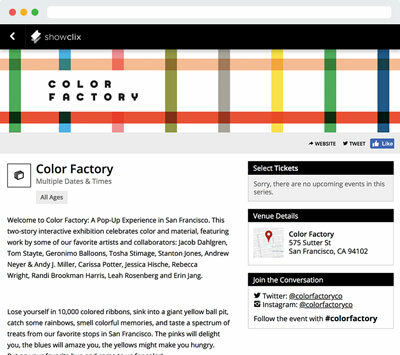 Sell tickets on vibrant, engaging event pages that match the look and feel of your brand. Lacking in design expertise? Ask your event specialist for assistance from our talented graphic design team. 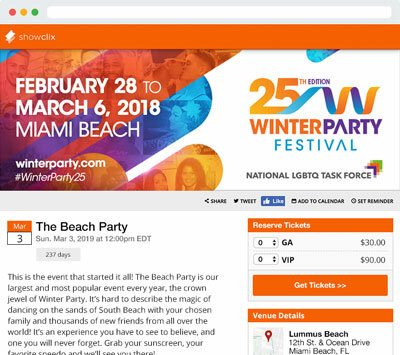 The responsive design of our event pages dynamically arranges page elements to provide your customers with an easy, fast checkout experience on any computer, smartphone or tablet. 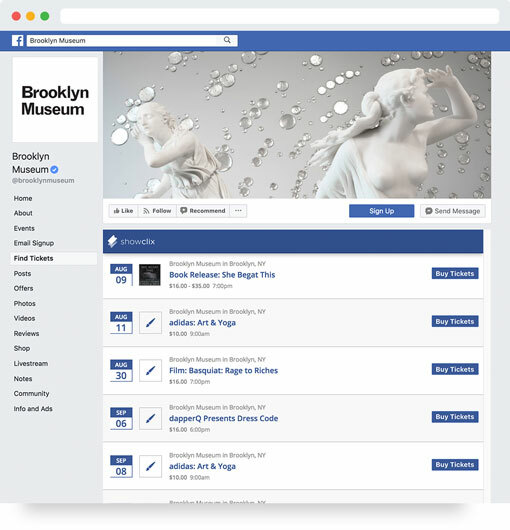 Integrate your ticket sales directly with your organization’s official Facebook Page. You’re already using Facebook to connect to your customers. Stay on top of your social interactions and provide easy ticket sales in the same convenient location. It only takes a minute to install our app and add a prominent Find Tickets button to your brand’s Facebook Page. 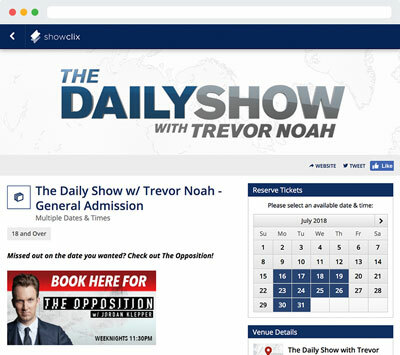 Keep your customers and your web traffic on your own website with IFrame widgets, or direct your customers to a custom ticketing page on the ShowClix domain. Either way, you’ll maintain the same secure sales process. Make the most of every transaction. Collect vital customer data during checkout by providing survey questions or application forms for potential ticket registrations. ShowClix automatically pushes to popular event aggregators like Bandsintown and Local.com. Your event pages are constantly updated and tested to align with SEO best practices. Full support for Schema.org, Twitter Card, and more. Reach new audiences by encouraging customers to share events and their ticket purchases with their friends via email, Facebook, or Twitter. Create, draft and send emails to your customer database completely within the system. Deliver important updates or promote future events to past customers. We offer free customizable ad space on every print-at-home ticket. Showcase upcoming events with a calendar, or generate additional revenue by promoting sponsors and affiliates. Agent automates everday marketing tasks so you can focus on the important stuff. Tweet to create urgency among followers when 90% of tickets have been sold. Send your team a text when VIPs arrive and greet them at the gate. Change price levels when sales hit a custom threshold. These are just a few of the ways Agent saves time and helps you sell more tickets. Our built-in social media features let you reach your customers on the platforms they use the most. Use the Marketing Dashboard to increase social engagement, sell tickets directly on your Facebook page, and gather intelligence on your marketing campaigns. Gather instant surveys and valuable marketing data directly from your customers when they purchase tickets. Register press passes and more by sending out application forms. You’ll be able to manage submissions and send ticket offers all within the system. Our core ticketing services require a small negotiable fee per ticket, which 90% of our organizers pass on to their customers. Keep your ticket prices affordable and your customers happy, while maintaining your bottom line. Want to receive a pricing quote from our specialists? Learn about our box office, admissions and RFID solutions, built and proven to handle everything from small events to major conventions.